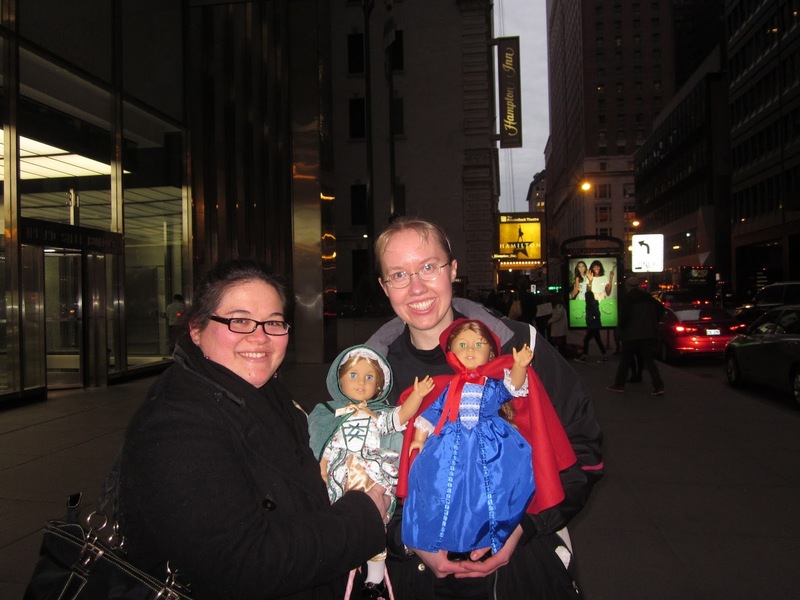 This is the most historically inaccurate episode of the little Felicity series you shall ever read. It is also the last episode. To read part 1 click here, part 2 here, part 3 here. 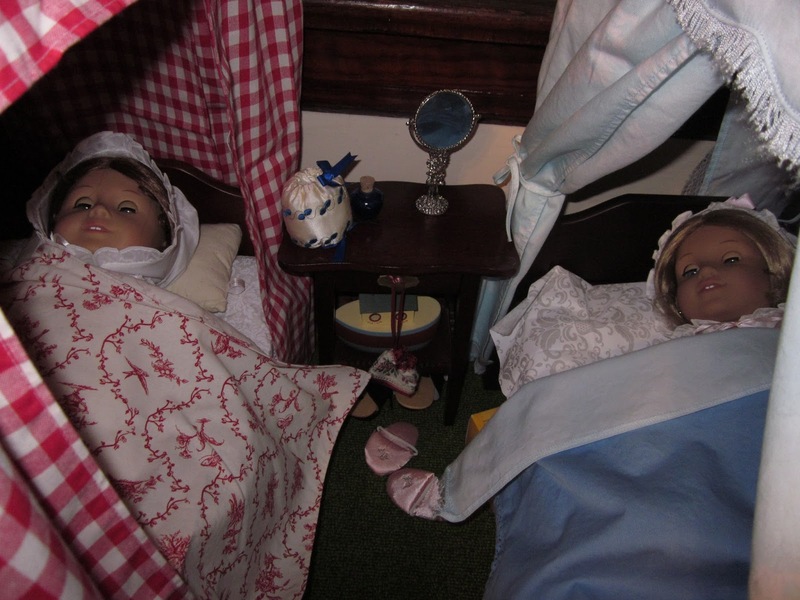 Felicity and Elizabeth were asleep in Felicity’s house. 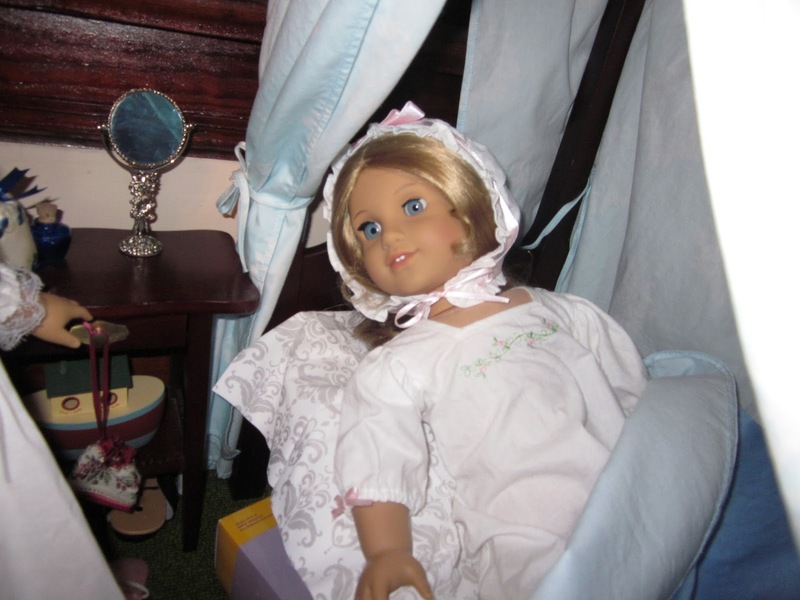 The morning sunbeams streamed in from the window and lit up the curtains of Felicity’s bed. She stirred and then sat up with a jolt. Today was the day! The girls tumbled out of bed, washed up and got dressed in their fine evening gowns. They raced down the stairs where Mrs. Merriman was just putting some eggs on their plates. The girls tried to be as ladylike as they could and shoveled scrambled eggs in their mouths as fast as they could, but it was probably a good thing they were the only ones at the table. The two girls bounded down the steps, and headed to the Palace Green where two carriages were lined up all along the the Governor’s Palace. Immediately they were accosted by a servant. “Ah! One of you must be Miss Felicity Merriman, and the other Elizabeth Cole I presume?” he asked. “Indeed he is, and I suppose we’re fleeing with him for a time and helping him do it, too,” Elizabeth said with frown. “Do you know what he looks like?” Elizabeth asked. “Well, I’m happy to have human escorts. It’s safer that way,” Felicity said. 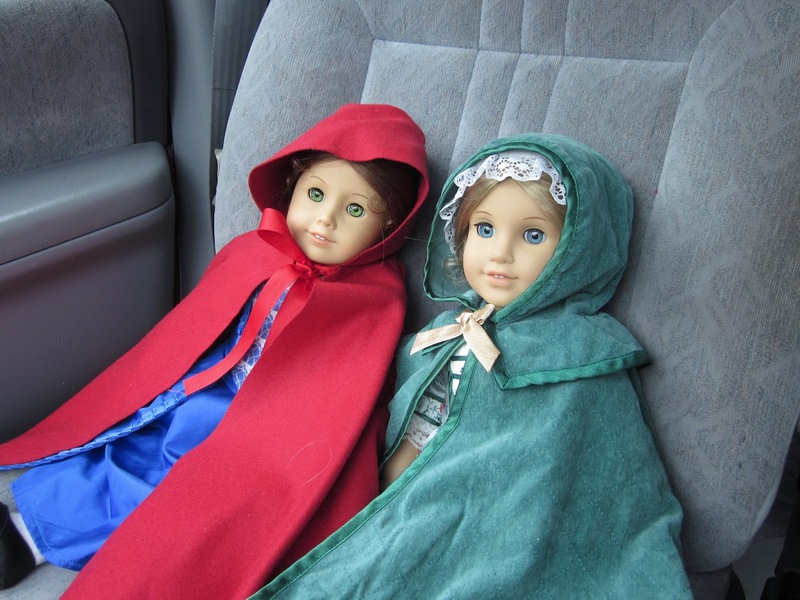 The drive to New York did not seem to take very long at all, but the dolls knew whenever they were with human escorts strange things often happen. 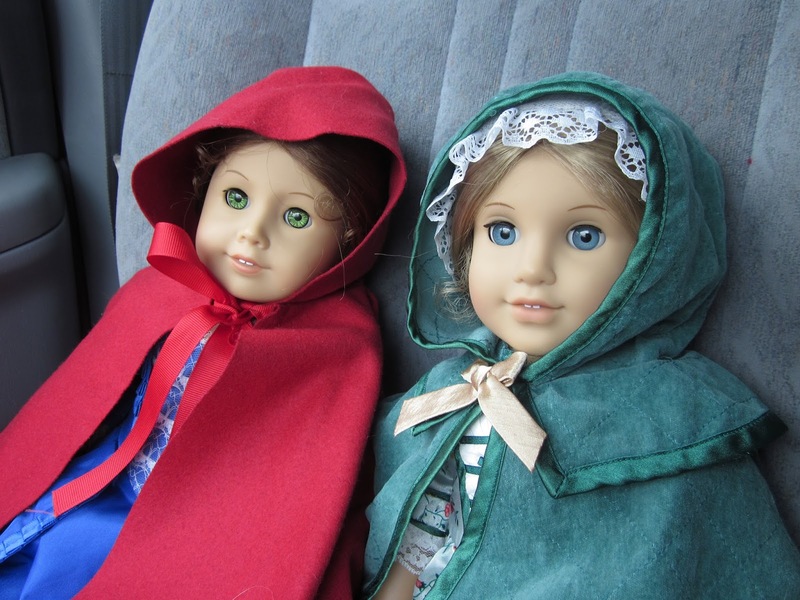 When they arrived, Felicity and Elizabeth stared about them in wonder. Everything was so loud, and busy, and noisy! Carriages rushing by, lights flashing everywhere, people shouting. 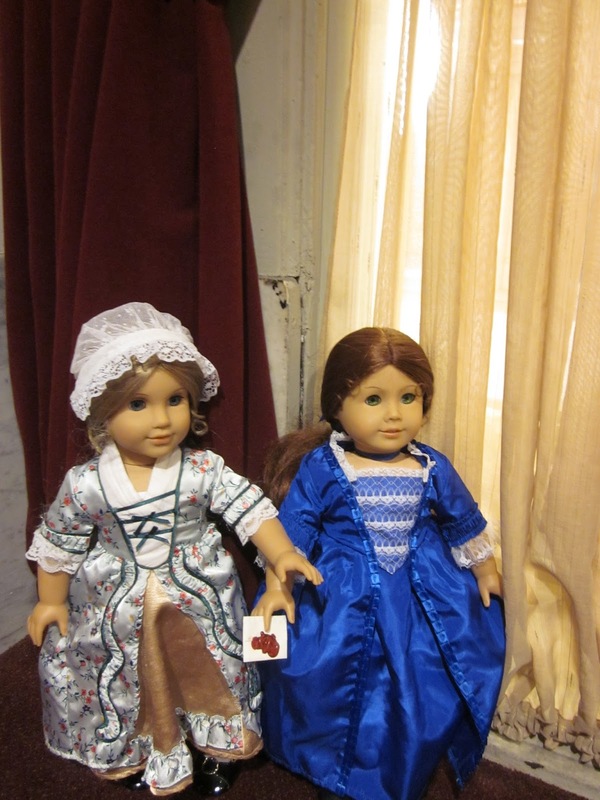 “We certainly are very far away from Williamsburg,” said Elizabeth, slightly terrified. “Look at these buildings! They’re so tall! I can’t even see the tops of them! I’ve never seen anything like this,” Felicity said. They watched the city go blasting by them in wonder as their escorts carried them toward a building decked out in black and gold. “Did you see that?” Elizabeth whispered. 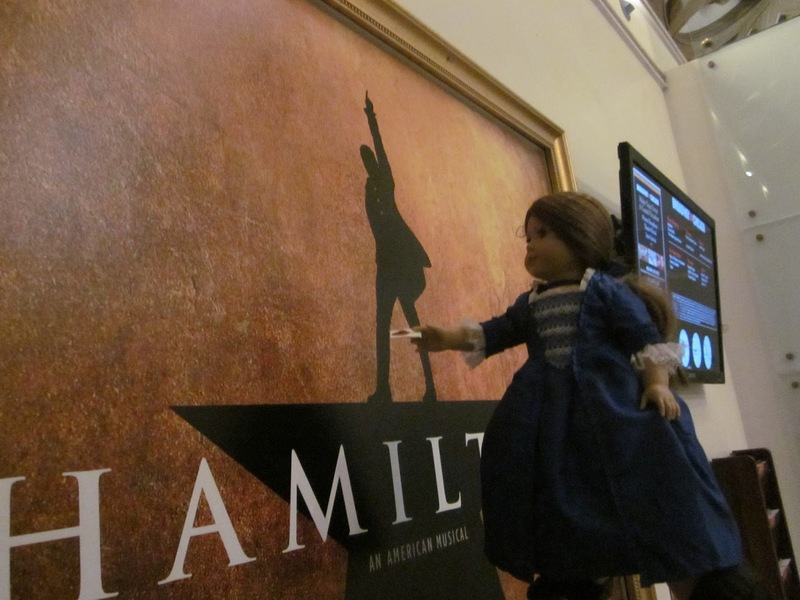 “That says Hamilton up there!” Elizabeth pointed up. “I would assume so. Everywhere you look it says his name!” Elizabeth pointed at some more signs, “Maybe he can’t see very well, so he needs signs telling him where he lives,” Felicity said. 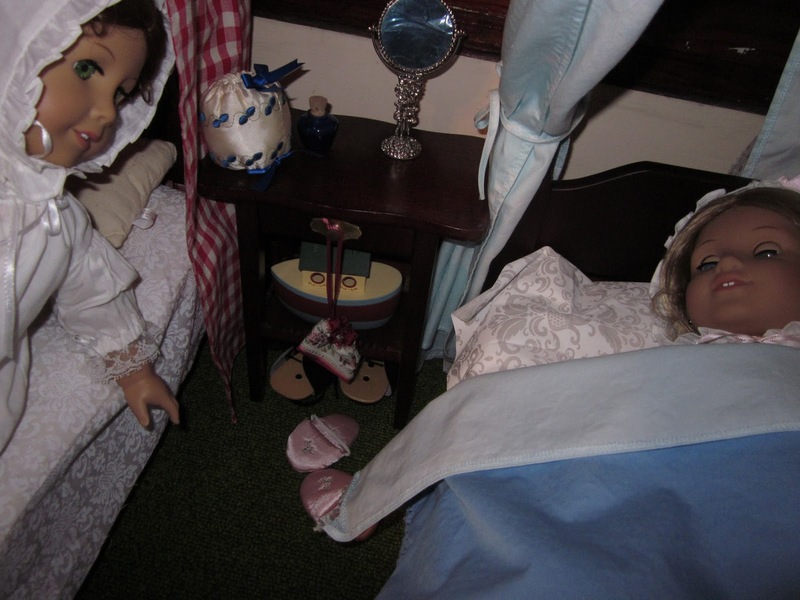 The dolls were amazed to see that even inside the house there were signs that bore his name. They were escorted upstairs and then placed on a balcony. They looked down at the people below. 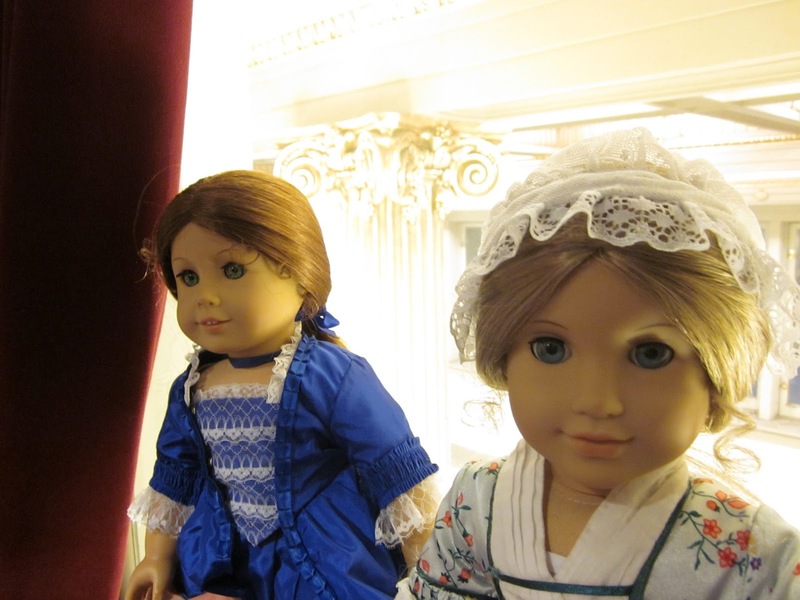 The dolls were quiet, watching the people down below, searching for someone important looking. Felicity gasped and took the letter out of her pocket, “Look at that man! That has to be him! He’s wearing a military uniform.” She started walking towards him. 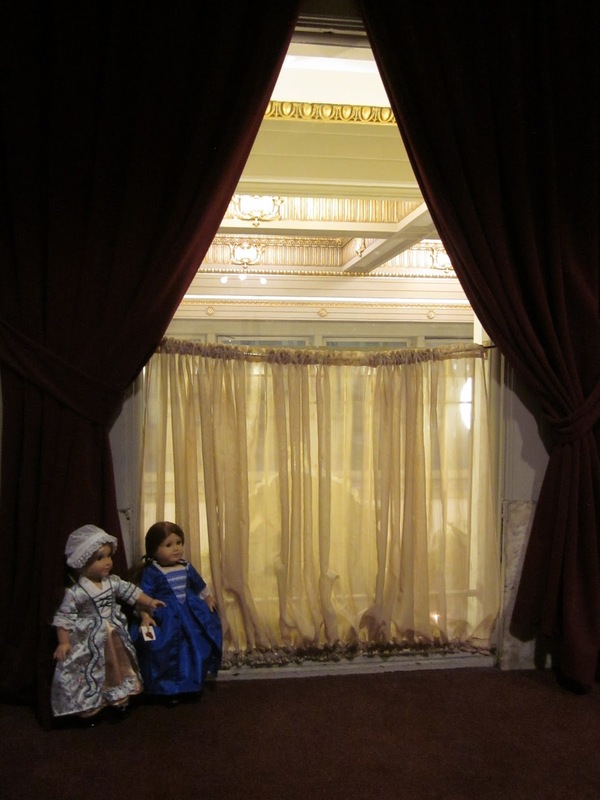 The dolls waited and watched as more and more people passed by them and entered the ballroom. 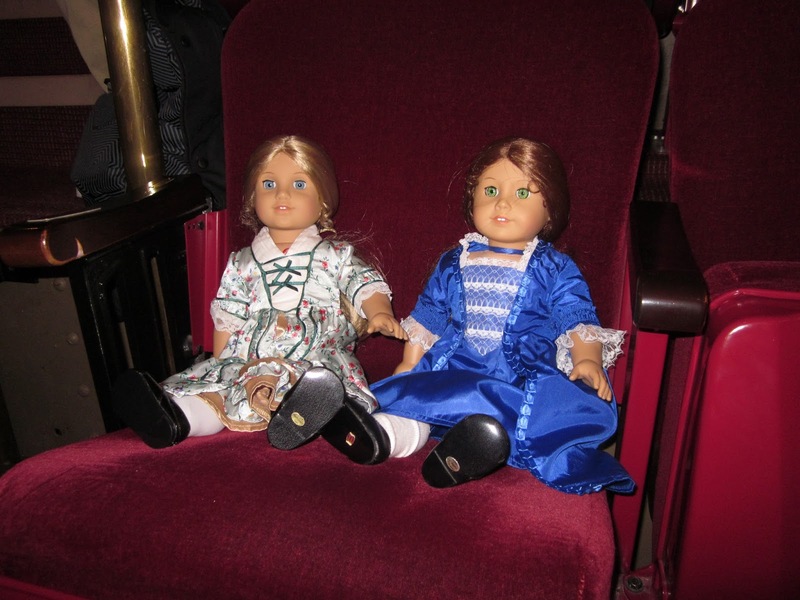 The dolls entered the room and sat down on very fancy plush seats to watch the beginning of the dancing. Felicity and Elizabeth got so involved in watching the dancers sing and dance they didn’t even think to join in themselves. The dancers and singers told a story, a wonderful, sad, but beautiful story of a man who cared so much about a country he entered as an immigrant. He wanted to make this brand new country a strong and independent nation for his wife, his children, and everyone else living in it. He spent his entire life trying to accomplish that, making mistakes along the way, both large and small. He accomplished so much for this country and died leaving such a legacy, Elizabeth and Felicity were in tears by the end. 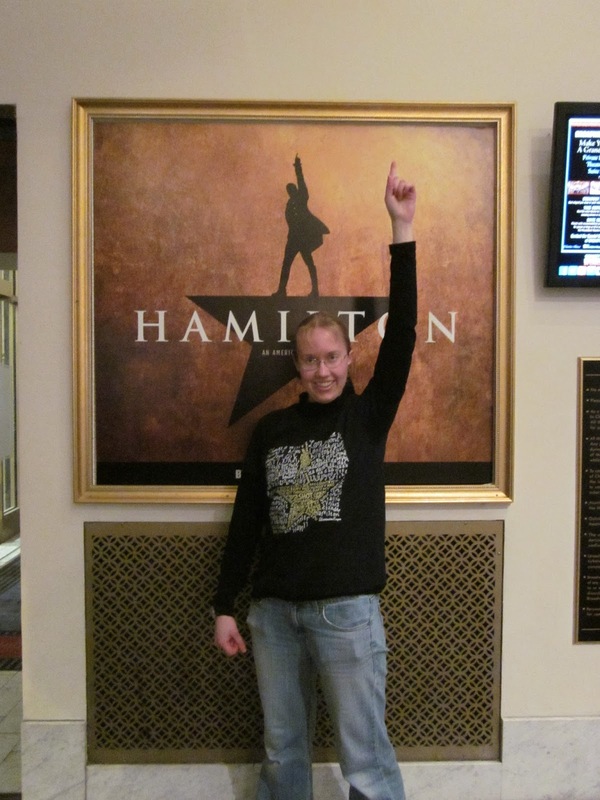 That man was Alexander Hamilton. 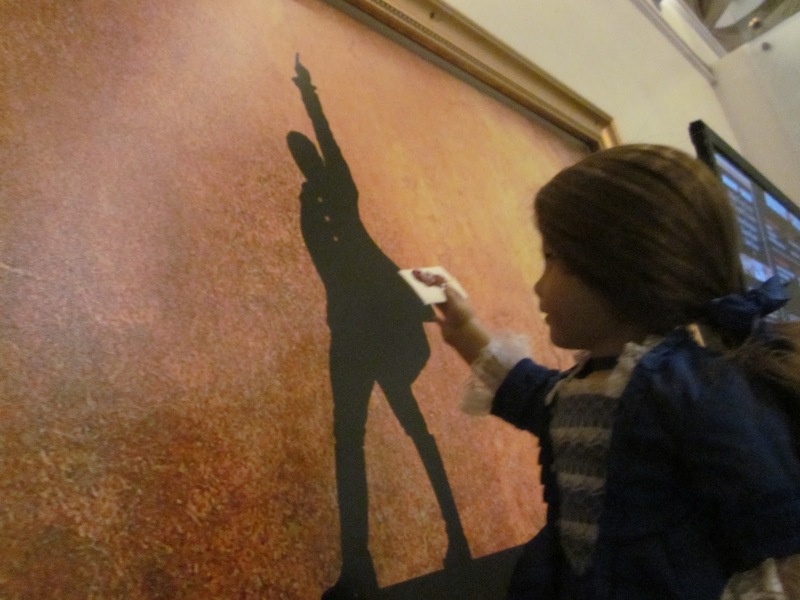 “All right, you really need to get going and hand that letter to Mr. Hamilton. We’d better head downstairs, I’d guess that’s where he’d be,” Elizabeth said to brush off Felicity’s compliment, but she blushed all the same. Yes! 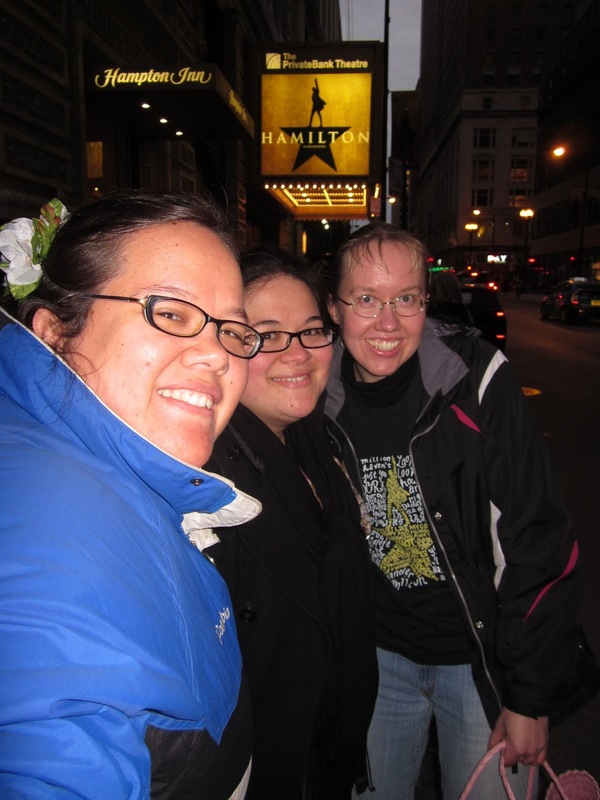 After buying the tickets in September and waiting months and months and months for this, my friends, Abby, and Evie and I finally got to see the Hamilton musical! It is something everyone, but especially every American should see. 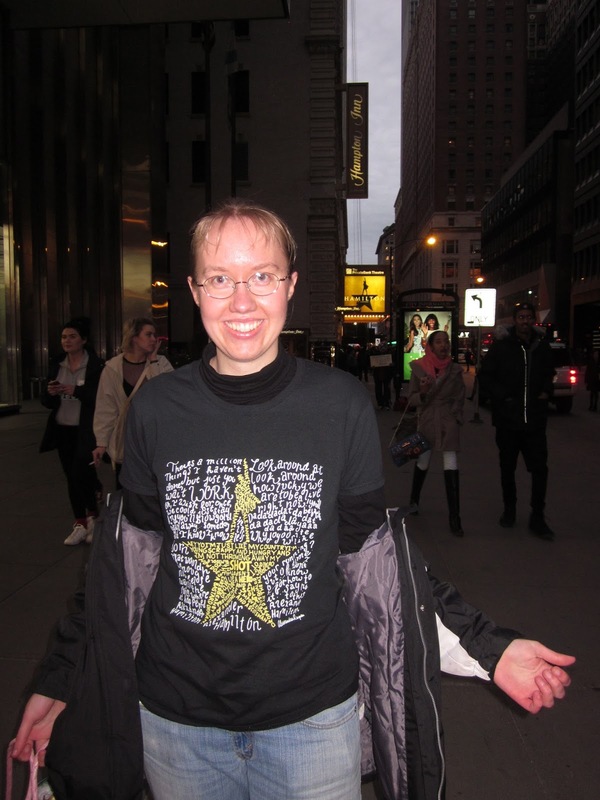 Can you tell I’m a big Hamilton fan? 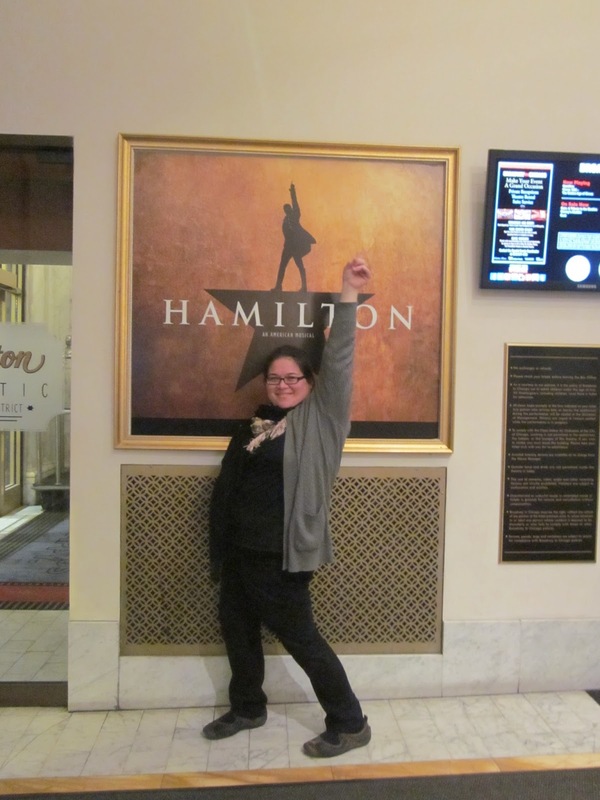 I’ve had Hamilton fever for months, reading everything I could about Hamilton, listening to the musical nonstop, having such fun talking about it with friends and family, so when the day arrived when we would finally see it I was beyond exhilarated. 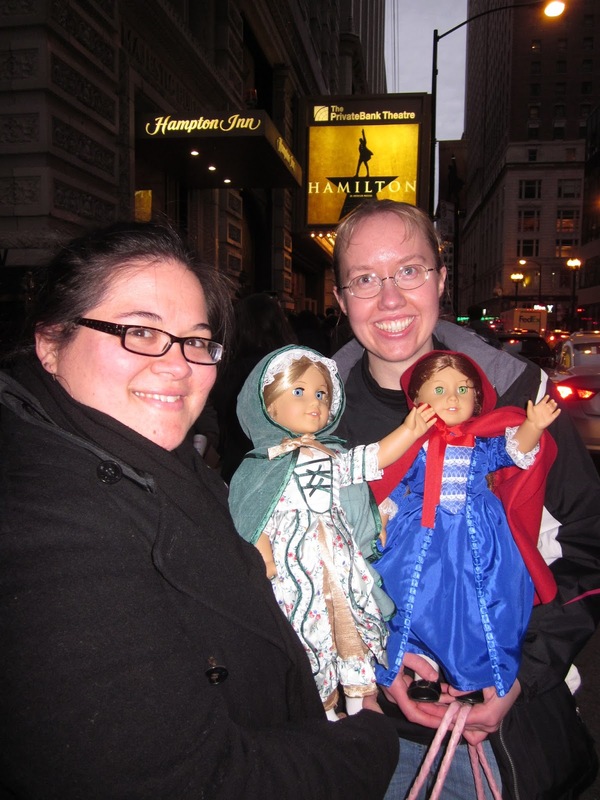 And as usual, bringing dolls to the occasion enriched the whole experience. 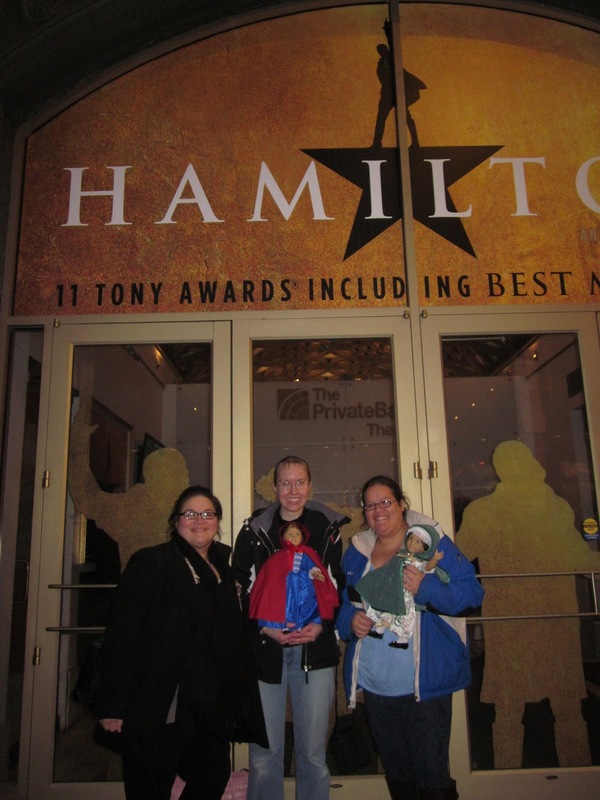 People seeing the show thought it was the coolest thing that I had brought the dolls and dressed them! 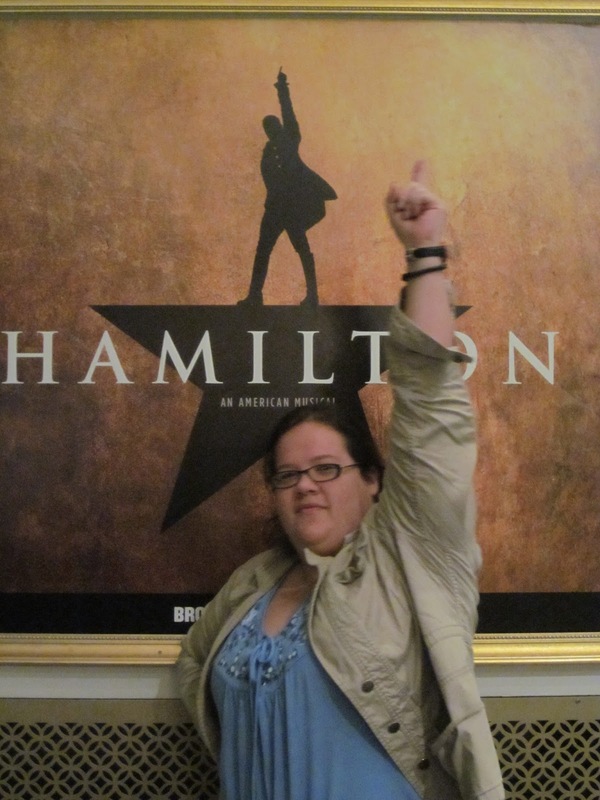 Well, maybe not quite like Eliza Hamilton, but close enough! Everyone was taking pictures or helping someone else take pictures in front of the building. There was such excitement in the air! 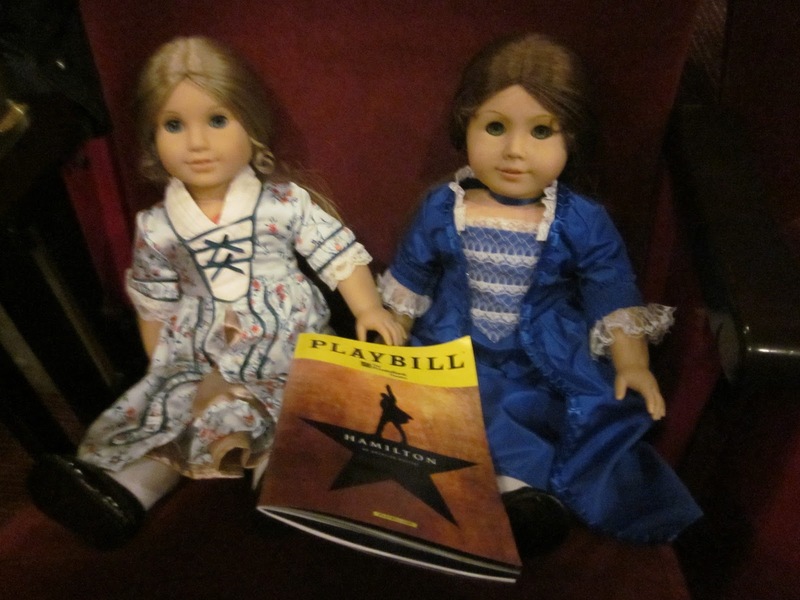 Then when we finally got in, I set the dolls on the seat and started taking pictures and an usher ran up to me and called out, “Wait! 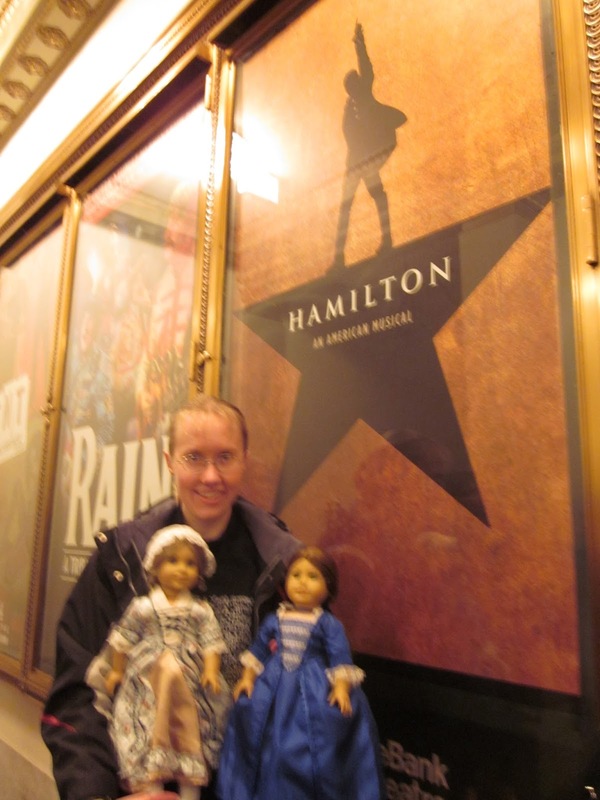 They need a program!” He handed me another playbill just for my dolls! 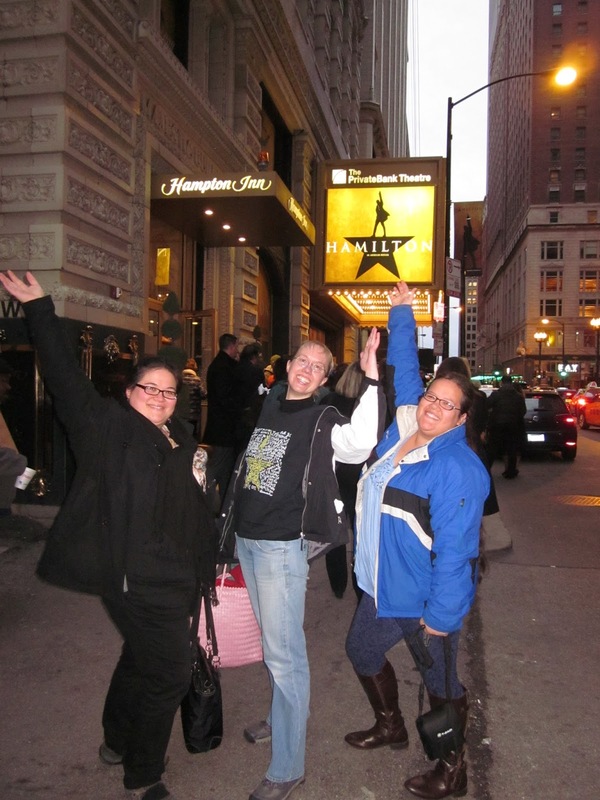 It was so, so, fun! 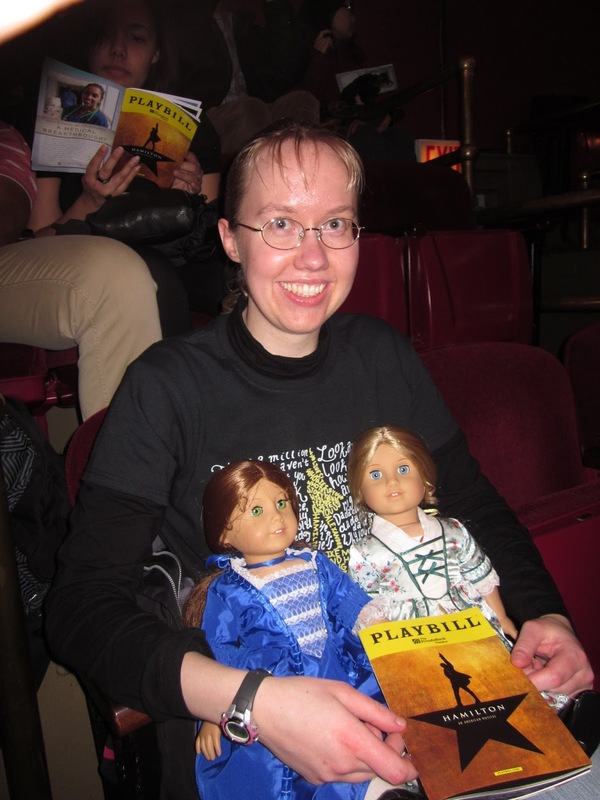 I had just as much fun watching the musical and watching the audience! We were all dancing in our seats. So many people had been listening and studying the music just like me! 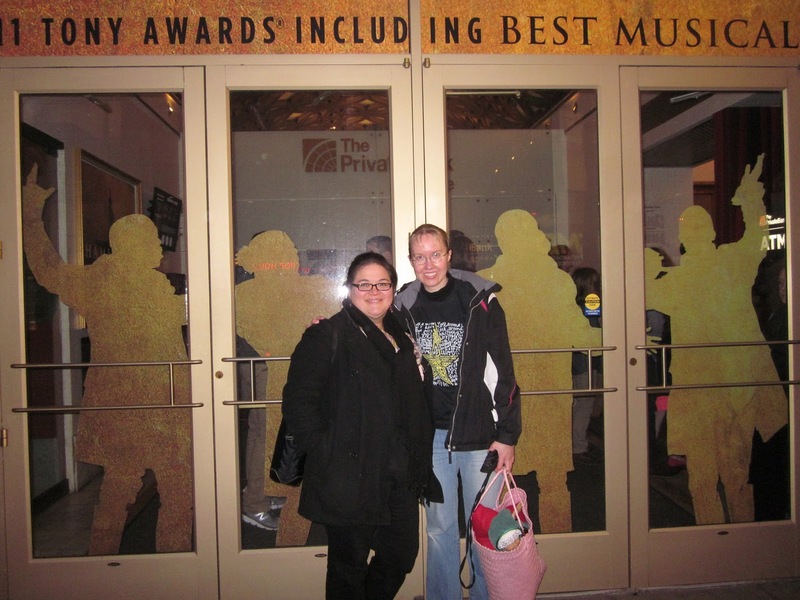 The musical really is phenomenal. It’s all it’s hyped up to be! If you get a chance to see it don’t hesitate to go! Yes! you should! My dad and I are hopefully going to go see it. I saw some tickets available at regular prices for September. Now THAT’S an ending to a story!!! Loved it! 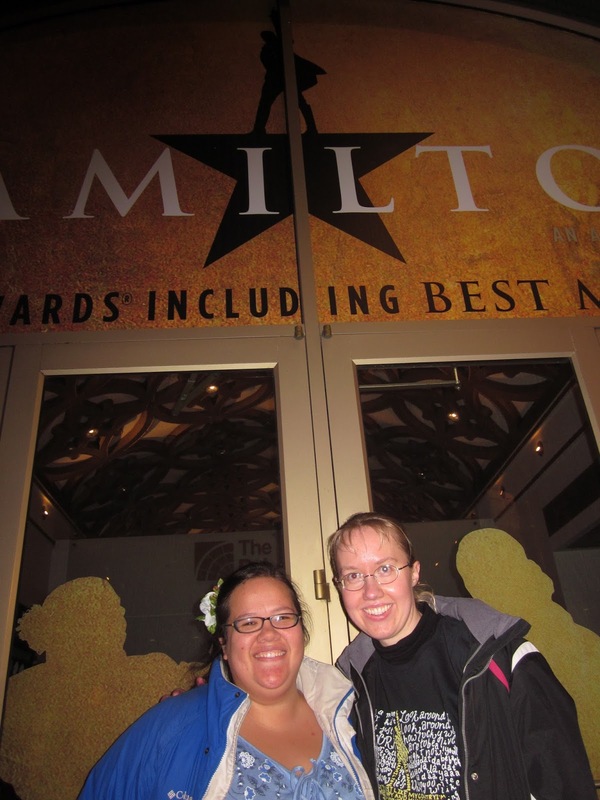 I would love to see Hamilton, perhaps someday. Thanks! I hope you do get to someday! I loved this! 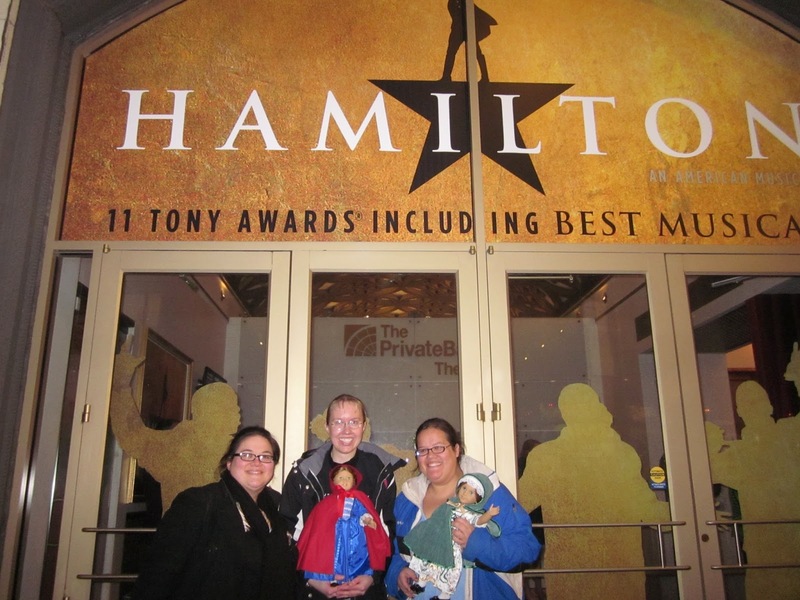 It was awesome that the dolls thought that it was Hamilton’s house because his name was everywhere! And Felicity giving George Washington’s letter to Hamilton’s picture at the end was so funny! My daughter and I laughed and laughed! 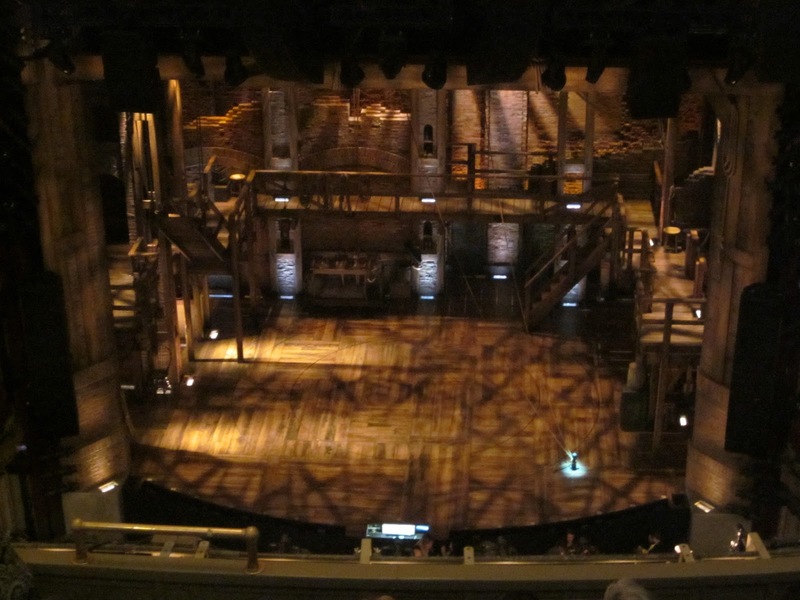 🙂 I haven’t seen Hamilton yet, but I’ve been looking into it more lately.